There are certain sounds that will make a driving enthusiast drool like one of Pavlov's famous dogs. Firing up a 2014 Ford Mustang Shelby GT500, for example, elicits a throaty rumble so intoxicating that every car fan in the neighborhood is liable to show up in your driveway. Lest anyone think it's some mere poser, this over-the-top Mustang variant has the bite to back up that bark. The Shelby GT500's supercharged V8 cranks out an astonishing 662 horsepower, making it the most powerful V8 ever squeezed beneath the hood of a production car. In practical terms, that translates to a 0-60 mph time of just 4 seconds and a top speed of more than 200 mph, numbers that put it on par with exotic supercars with six-figure price tags. To complement all that power, the GT500 gets a lightweight carbon-fiber driveshaft, upgraded brakes, beefed-up suspension bits and the latest Goodyear Eagle F1 Supercar G:2 tires. Adding the available SVT Performance and Track option packages helps boost the car's abilities with electronically adjustable shock absorbers, firmer springs and enhanced cooling for the engine and transmission. At times, though, the GT500, as good as it is, can seem as if it's hampered by the limitations of the basic Mustang platform architecture. It's a capable handling car, but with its low-tech, solid rear axle suspension design, the Shelby GT500 can't match the handling confidence you'd get with the 2013 Chevrolet Camaro ZL1 and its fully independent suspension. As far as everyday annoyances are concerned, there's the 'Stang's underwhelming interior design (which is much more of an issue at the GT500's higher starting price) as well as tall rear-end gearing that can make smoothly pulling away from a stop tricky. The 2014 Ford Shelby GT500 isn't the only max-attack muscle car vying for your attention, either. Topping that list is the Camaro ZL1, which isn't as quick in a straight line but did best the Mustang in a recent Edmunds comparison test. The 2013 Dodge Challenger SRT8 can't match either the Ford or Chevy in terms of horsepower numbers or raw acceleration, but it's certainly their equal when it comes to good, clean hooligan fun and old-school muscle car cool. Although we wish the Shelby GT500 had a nicer cabin and felt more composed going around corners, in the end, these big-power muscle cars are all about your gut reaction. And if you want a very fast coupe or convertible with a beefcake V8 and styling to match, the 2014 Ford Mustang Shelby GT500 is hard to beat. The 2014 Ford Mustang Shelby GT500 is a high-performance model offered in coupe or convertible body styles and a single trim level. Standard features include 19-inch front and 20-inch rear alloy wheels; xenon headlights; foglights; an aluminum hood with heat extractor; a rear spoiler; air-conditioning; leather upholstery with faux-suede trim; full power accessories; a six-way power driver seat; heated front seats; a leather- and suede-trimmed steering wheel; cruise control; an auto-dimming rearview mirror; adjustable multicolor ambient lighting; Ford's Sync voice-control system; and an eight-speaker sound system with satellite radio, a USB port and an audio input jack. Options include an SVT Performance package that includes unique wheels, a Torsen limited-slip rear differential, electronically controlled shock absorbers, upgraded springs and stabilizer bars, and a unique shift knob. The SVT Track Pack (coupes only) bundles oil, transmission and differential coolers. An available Electronics package adds dual-zone automatic climate control, a navigation system and HD radio. Stand-alone options include manual-adjustment Recaro front sport seats, a glass roof (coupes only) and an upgraded audio system with nine speakers. At the heart of the 2014 Ford Mustang Shelby GT500 is a supercharged 5.8-liter V8 that puts out 662 hp and 631 pound-feet of torque. Power goes to the rear wheels by way of the only transmission offered, a six-speed manual gearbox. EPA fuel economy estimates are 15 mpg city/24 mpg highway and 18 combined. In Edmunds performance tests, the GT500 posted a 0-60 mph time of just 4 seconds That's quicker than the Camaro ZL1 and Challenger SRT8. Standard safety features on the 2014 Ford Mustang Shelby GT500 include antilock disc brakes, traction and stability control and side-impact airbags for front seat passengers. In government crash tests, the regular Mustang earned an overall safety rating of four stars (out of a possible five), with four stars for total front-impact protection and four stars for total side-impact protection. 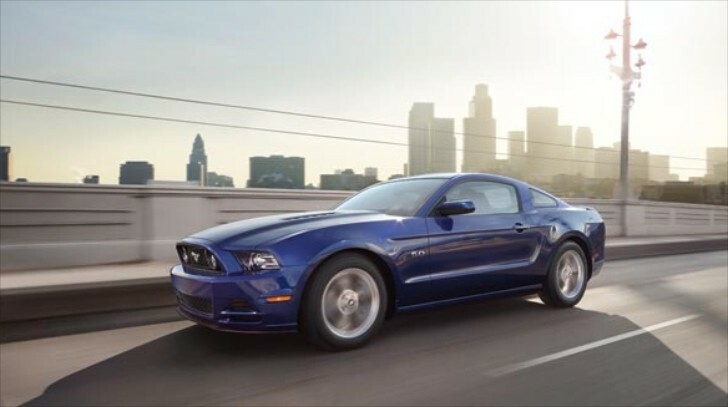 In Insurance Institute for Highway Safety crash tests, the Mustang coupe earned a top score of "Good" for frontal-offset collision protection and a second-best "Acceptable" for side-impact protection. In Edmunds brake testing, the GT500 came to a stop in 109 feet. That's a pretty short distance, but it's not exceptional for this class of car. 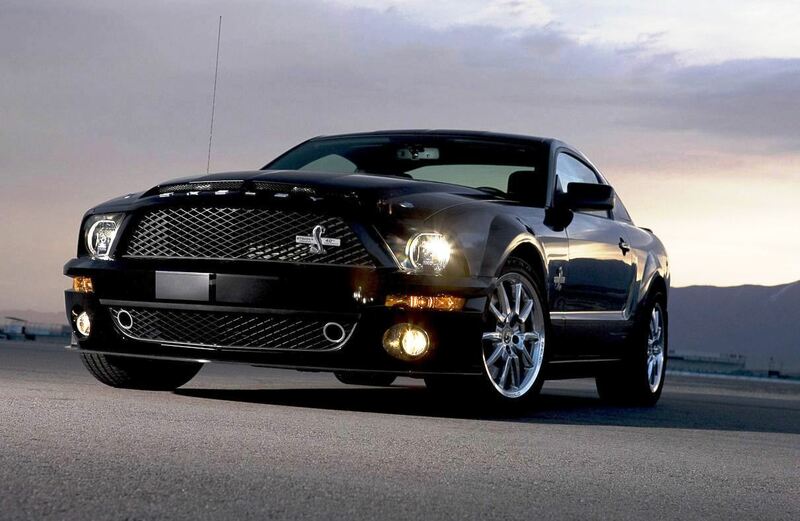 For all of its menacing exterior styling, the 2014 Ford Mustang Shelby GT500 looks plain inside. In fact, if it weren't for the leather- and faux-suede-trimmed seats and steering wheel, you might not realize that you're in Ford's top-of-the-line Mustang. Sync's voice activation features greatly simplify operation of audio, phone and navigation systems. The buttons themselves don't have a particularly solid feel, though, and a large percentage of the door panels and center console is taken up by hard plastic. One feature the Mustang lacks is a telescoping steering wheel, though thankfully, most drivers should be able to find a comfortable seating position. We recommend paying for the optional Recaro sport seats, which provide significantly better support during aggressive driving. The downside to the Recaros is that you give up the GT500's standard power adjustments and seat heaters. As in most other sport coupes and convertibles, the Shelby GT500's rear seat is cramped and difficult to access. Coupes feature split-folding rear seatbacks (though the pass-through is narrow), and convertibles have fixed rear seats. Trunk space is a decent 13.4 cubic feet on coupe models. Convertible buyers will have to pack light, as the folding top mechanism shrinks capacity to 9.6 cubic feet. With its 662-hp V8 and a claimed 200-mph top end, saying the 2014 Ford Mustang Shelby GT500 is fast and fun is like saying Yellowstone is a pretty park. It's just a bit bonkers to think that you can go see your local Ford dealer and purchase a Mustang that's throwing down nearly as much power as a Lamborghini Aventador. Some of the GT500's appeal is lost in the transition from concept to reality, however. The tall gearing, which Ford uses to get those impressive 0-60 times (in 1st gear) and top-speed numbers, makes it difficult to achieve smooth launches whether you're at the drag strip or dropping off the kid at school. (Our best 0-60 time was achieved using the test car's programmable launch control system, as our trained drivers had to concede that they were unable to manage wheelspin as well as the car's electronics.) Once you're underway, the transmission's notchy feel and tendency to resist aggressive shifts between 1st and 2nd gears can be frustrating. Although Ford's SVT engineers have gone to great lengths to give the Shelby GT500 handling on par with its massive power output, the Shelby is still at a bit of a disadvantage because of its solid rear axle suspension design, which can make the car feel unsettled in bumpy corners. Outward visibility is better than that of the Camaro ZL1 or Challenger SRT8, but it's still limited enough that driving fast on winding back roads takes a fair amount of nerve. If you want to drive it every day, the 2014 Ford Shelby GT500 will oblige as long as you're prepared to make a few sacrifices. Its ride quality is acceptable considering the type of car. Tire and road noise are similarly livable, but don't expect luxury car levels of quiet. The GT500 is a pony car, and it sounds like one.